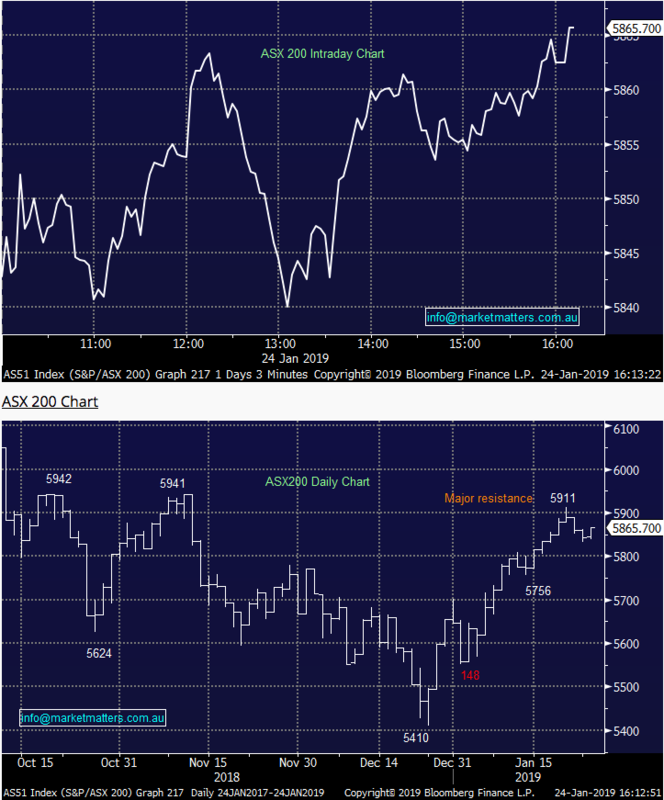 The ASX edged higher with most of the gains coming late in the day, strong buying in the match with light volumes and options expiry playing around with prices - some big lines in the banks went through today ahead of what should be a fairly quite Friday leading into the Australia Day long weekend – remember it’s a Holiday Monday. 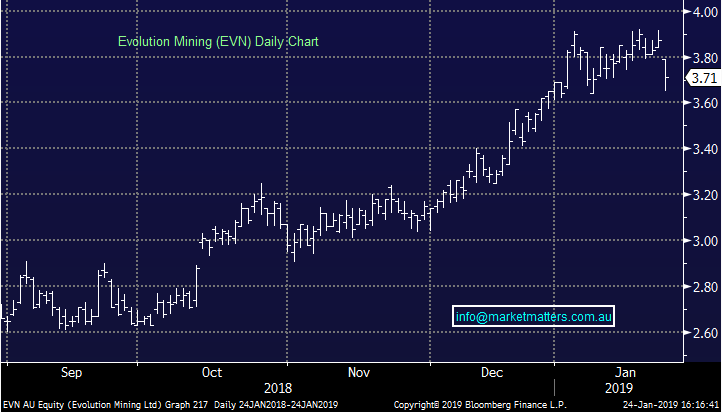 There was strong buying amongst the Energy stocks today, Santos a standout adding +3.86% on a good production report while Oz Minerals booked another meet / beat, its 16th consecutive quarter of good numbers - the stock ended up +3.38% to $9.47 – we look at both stocks below. On the economic front, more evidence that employment remains strong in Australia with the unemployment rate dropping to 5.0% versus 5.1% expected. The participation rate was a shade lower than expected which played into the better result, however importantly, we’re not seeing any meaningful deterioration in the labour market. 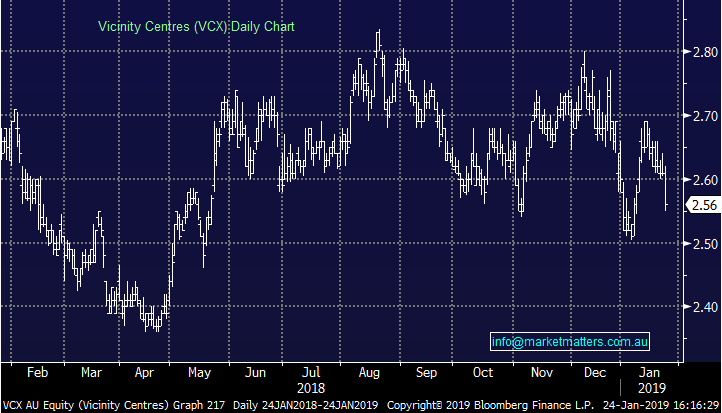 Broker Moves; Feb earnings season is just around the corner and brokers are making some late calls ahead of the period. Today, broker downgrades focussed on Challenger Financial after yesterday’s downgrade while Regis Resources also copped it on the chin. 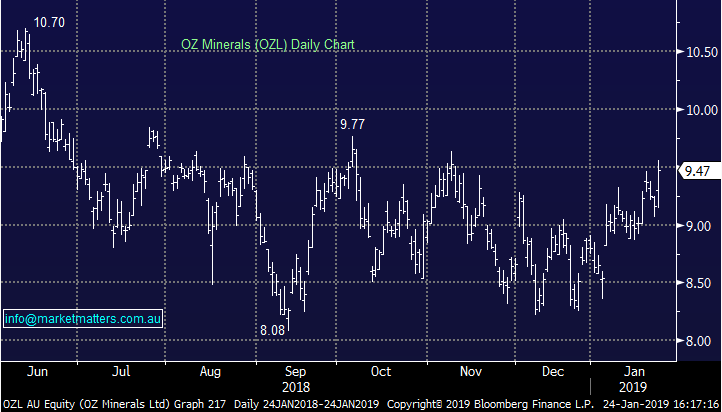 Oz Minerals (ASX:OZL) $9.47 / +3.38%; A nice set of production numbers from Oz Minerals (ASX:OZL) today, and one of the rare examples where we’ve seen costs trend lower through the period. Oz has now become well engrained as a company that meets / beats guidance estimates with the last 16 quarters of achieving guidance – a big turn-around from the Oz of old. That’s a consistent record that deserves credit and the market is starting to take note. Today they hit all production guidance metrics at the high end of the range. Costs are trending lower and were below the bottom end of the guided range due to a very low cost quarter at Prominent Hill. Oz is now at peak construction phase on the Carrapateena project, yet their balance sheet remains in great shape maintaining a cash balance around ~$500m while paying dividends. Operationally, this is a company performing very well and the balance sheet is in good shape, they just need some stronger commodity price tailwinds and the stock should start rocking & rolling. One clearly on our radar. 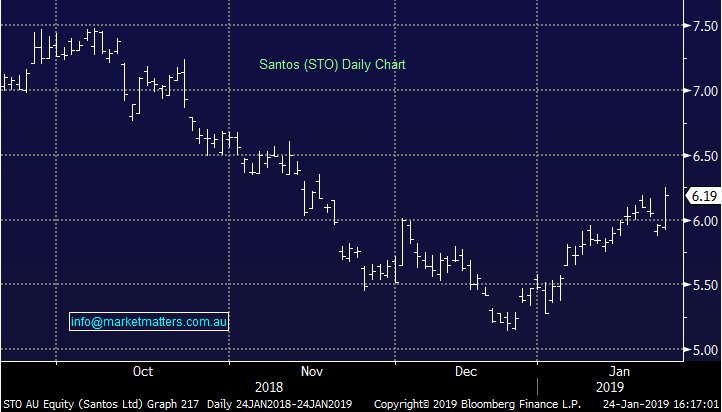 Santos (ASX: STO) $6.19 / +3.86%; The oil & gas name has rallied outperforming its peers following a meet / beat in the 4th quarter production numbers printed this morning. Production numbers were in line with the previous quarter as well as providing production guidance for 2019 which beat many analyst expectations. The December quarter did receive a small bump which supported production numbers, ensuring the figures do look better than expected. Santos completed the purchase of Quadrant Energy in late November, with many analysts not including the new asset in their figures at the time. The market will now turn to the company’s full year result due out in late February which will provide a better read through of the Quadrant purchase, as well as cost and capex guidance for the year ahead. So far though, no surprises here which the market always takes a liking to. The company can only control so much however, with oil and gas prices fluctuating. With global growth fears looming, and a range of instability throughout the world, energy names aren’t yet attractive in our view.